View the full Federal IT Top 100 list. Selling information technology to the federal government isn’t for the faint of heart. But for companies that have learned to navigate the government’s arduous requirements, the outsized rewards are hard to ignore. Those rewards are now clearer with a new set of rankings that for the first time reveal what the nation’s leading IT providers generated in revenues from the sale of information technology hardware, software and services to the federal government. The findings put into sharper relief the role played by a number of companies, including Lockheed Martin, Leidos, Northrop Grumman and SAIC, that focus their businesses primarily on selling to the federal government, and that generate a significant amount of revenue selling IT products and services to the government. A separate ranking also illustrates how important government business is to many of the nation’s largest enterprise IT companies that sell across many industries, including Hewlett-Packard (now HP and Hewlett Packard Enterprises), IBM, Dell and Microsoft, but also firms like Amazon Web Services. View the full Top 25 list. These inaugural rankings, developed by IDC Government Insights in conjunction with FedScoop, are unique from other industry lists, which traditionally report the volume of government contracts companies have landed in a given year. While contracts reflect the promise of business, they often don’t translate into actual sales or accurately reflect what the government spends each year. In contrast, these new rankings are based on revenues generated from the documented sales of IT hardware, software and services to the government. Additionally, IDC has removed non-IT spending that may end up in IT contracts (such as management, consulting and energy costs), which don’t necessarily represent pure information technology products and services. 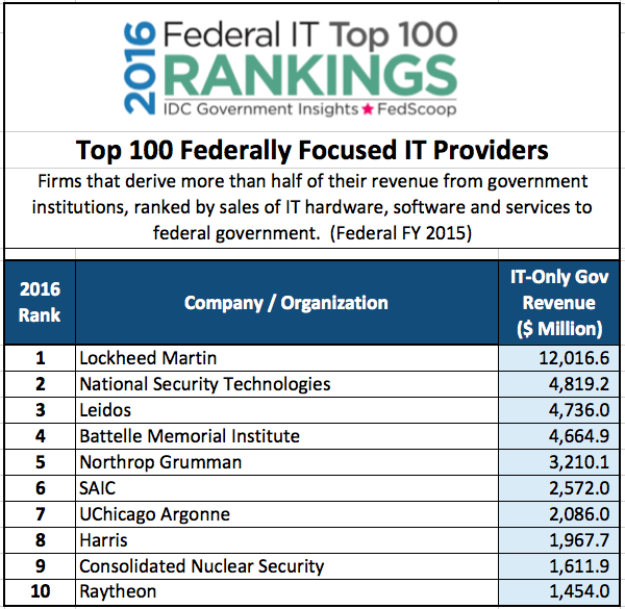 The Federal IT Top 100, which groups vendors that derive more than half of their revenue from government institutions, and ranks them based on their revenue from the sales of IT products and services to federal agencies. That can include everything from cybersecurity systems, to data analytics software, to cloud computing services. The Top 25 Enterprise IT Providers to Government, which groups major enterprise IT companies serving multiple industries that derive less than one-third of their revenues from government institutions and ranks them by their estimated government-only sales. The list includes several companies, such as Battelle Memorial Institute, that have a long history of working with civilian and defense agencies but aren’t generally well known. Read profiles on all 10 of these federally focused IT providers, beginning with Lockheed Martin. The revenue figures are based on data reported in the General Services Administration’s Federal Procurement Data System, USASpending.gov, OMB’s Federal IT Dashboard and other OMB reports, as well as the Securities and Exchange Commission’s Edgar database and vendor reports. The figures were then adjusted to eliminate revenues not directly associated with IT hardware, software or services sales to federal agencies, such as management consulting work. Finally, the figures were aligned with the government’s 2015 fiscal year, which runs from Oct. 1, 2014, through Sept. 30, 2015, to more accurately match federal IT spending data. The resulting figures were presented to every company on the list for verification, although not every company agreed to confirm the numbers. The rankings put federal government IT spending in a new light by revealing more clearly where taxpayers’ dollars went for the government’s purchase of IT equipment, software and services. According to a White House Office of Management and Budget report, the federal government spent $86.7 billion on information technology in fiscal 2015. “That’s the largest single vertical market for IT in the U.S. today, representing about 8.6 percent of all IT spending in the U.S, followed by the banking industry, at 7.6 percent,” said McCarthy, based on IDC research. IDC is recognized globally as a leading provider of market intelligence and advisory services for the IT, communications and consumer technology markets. But trying to follow the money isn’t easy. That’s because most publicly available data about IT spending are either contained in multiyear contract awards announcements or are tied to specific agency IT projects involving multiple vendors. The new rankings provide not only a first-of-its-kind view of which companies are on the receiving end of federal IT spending. They also provide a snapshot of the ecosystem of companies and organizations that specialize in meeting the government’s vast needs, from the battlefield to nuclear facilities to health care, all of which require IT products and services. 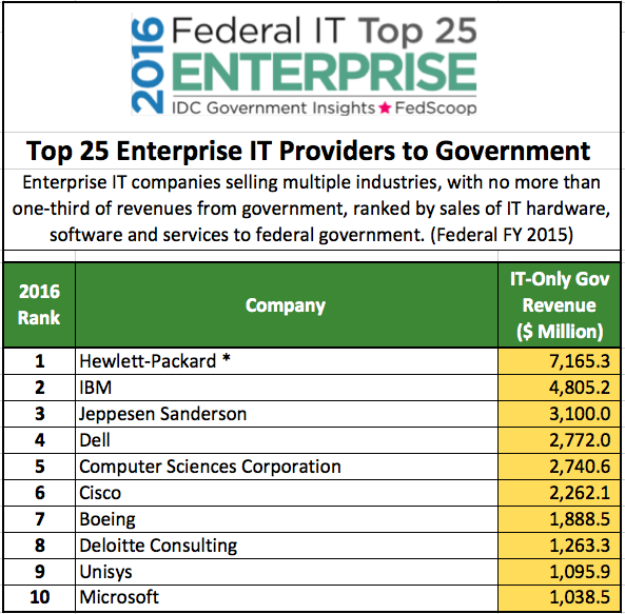 FedScoop encourages you to browse the full Federal IT Top 100 and Top 25 Enterprise IT Providers to Government lists. And to get a closer look at how critical federal sales are to big tech players, read FedScoop’s profiles on the top 10 companies. “We believe that this data gathering and analysis process, along with this way of segmenting top vendors, provides a more clear window into the government IT vendor data, and it builds a true picture of the top IT vendors serving the federal government today,” McCarthy said. Contact the writer at wyatt.kash@fedscoop.com, or on Twitter @wyattkash.